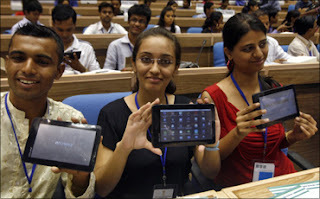 World's cheapest tablet PC from INDIA (specially for students) ~ Engineering projects ideas for final year students & paper presentations collection blog. India recently launched its tablet computer calling it the “computer for the masses”. The cost of this computer is between US$45 toUS$60, the reason behind the launch of this tab is to provide millions of student their access to technology. Data wind a Canada based company has produced this tabs our government has bought up to 100000 tabs from them for distributions in colleges and universities. The tab is of 17 inches has wifi enabled , mp3 player and 180 min of battery life .the Data wind company’s CEO has mentioned that their aim is to remove the price barrier for computing and internet access. He has also added that in future he is planning to reduce the cost even up to US$10.the tab has been named as Akash and it has been a huge success, firstly it will be distributed in colleges and university then they are planning to sell it in retail shops. Commercial manufacturers are hoping Indian customers will leapfrog personal computers to buy tablets, as millions did by buying mobile telephones instead of waiting for a landline. The Akash is part of a push to increase the number of students in higher education and to give them the technological skills needed to further boost the country's recent rapid economic growth. "When these devices are actually used by students across India we will then get valuable feedback," said Human Resource Development Minister Kapil Sibal at the launch event, where 500 students received the first models. "This is the beginning of a journey," he said, adding that 700 Aakashs are made daily and production would have to be increased rapidly.